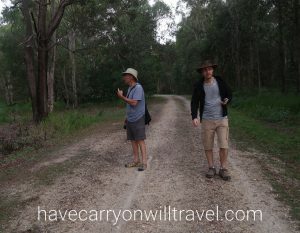 Murray, M and I walk through the Coombabah Lakelands Conservation Area this afternoon for some exercise and fresh air since it is too windy to go to the beach. Almost immediately we see wallabies. 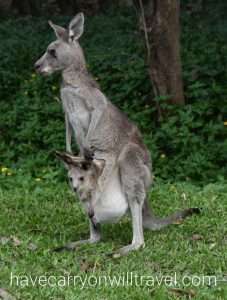 They are smaller than kangaroos, but look like them. Moms were carrying their young. This youngster had his feet sticking out and looked all scrunched up. I wonder if he is comfortable. 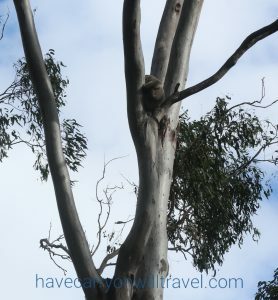 We meet some folks and they tell us they spotted two koalas in some trees down the path. We are given directions and after some hunting and lots of looking up, we spy this fellow snoozing. We could not locate his friend. 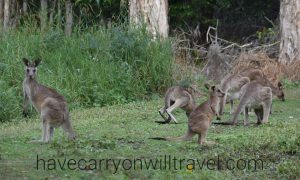 We wander the paths and marvel at the lush, green vegetation and all the wallabies, who seem mostly unafraid of us. I can’t help chuckling and saying “boing” “boing” each time one hops by.